The Hunt For Beauty: My Beauty Favorites! Foundation: Lancome Teint Miracle, HG forever. About to repurchase for the 7th time! Powder: MAC Mineralize Skinfinish Natural...another countless repurchase, it's magic in a compact. Primer: Monistat/Soothing Care Chafing Relief Powder-Gel...so cheap and works so well! I also use Clinique Pore Refining Solutions Instant Perfector with my primer. Total HG! Blush: Generally don't use blush. Bronzer: Generally don't use bronzer, either. Concealer: Many! Undereye: Bobbi Brown Corrector with Maybelline Superstay 24-hr on top, Spot Concealer: Maybelline Mineral Power, & Larger Areas/Redness: Coverblend Multi-Function. Highlight: For undereye I use LM Secret Brightening Powder and MAC Prep+Prime Highlighter in Radiant Rose. Face, that changes depending on my makeup. Moisturizer: CeraVe PM, both morning and night. Lipstick: Chanel Aqualumiere in Positano. Lip Balm: Nivea "A Kiss of Smoothness"
Mascara: I don't use mascara. I know, *gasp*. 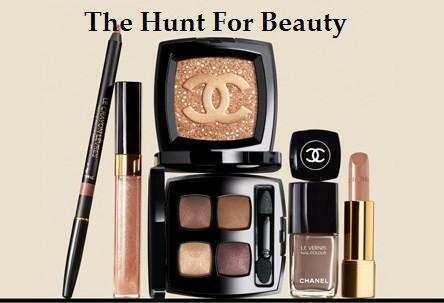 Favorite Brand, High-end & Drugstore: For high-end, I love Chanel. I also love Lancome, MAC, NARS, Dior, Chantecaille, & many more. For drugstore: Maybelline, L'Oreal, Revlon, Palladio, NYX, and many others. A few products from each.